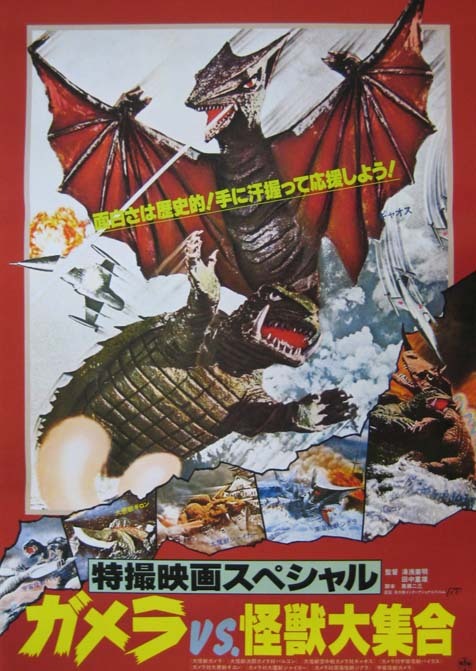 Gamera vs Gyaos (1967) – SKREEONK! Gamera’s at it again in his third movie, Gamera vs. Gyaos, which many believe to be the best of the series. And it is quite enjoyable. 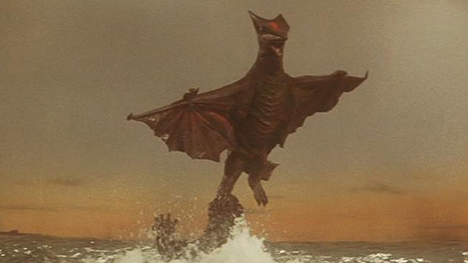 The title monster, Gyaos, is an interesting creation, along the same lines as the giant pterosaur Rodan from the Godzilla series, having many of the same characteristics; flight capability, the power to create gale-force winds from his wings, and powerful, un-bird-like legs. Aside from that, they are very different. 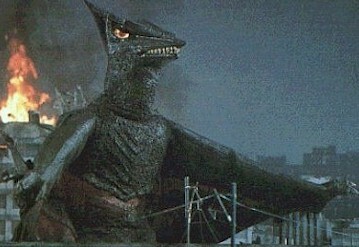 Gyaos has a wedge shaped, almost bat-like head with evil eyes. He is able to expel a sonic ray from his mouth, and can also emit a mist from his underside that has the power to snuff out flames and block sunlight (which he is very vulnerable to). He also has a ravenous hunger for human flesh. 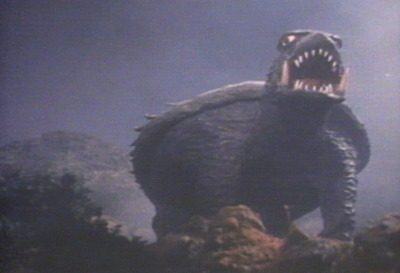 Gamera is about the same, only his red-tinted, scowling eyes are replaced by wide-open, almost deer-in-the-headlights looking eyes. That was the only noticeable difference, and it should be noted that Gamera’s personality has lightened up a bit from the previous movie. He does not attack Japan upon his initial appearance; instead, he comes to the aid of a young boy who is about to become Gyaos’s dinner. And after rescuing him, places the boy on his back and flies him to safety! Unlike the previous film, Gamera vs. Barugon, the initial fight scene in Gyaos is quite action-packed, with Gyaos almost being dried up in the sun and losing a foot to Gamera. Gyaos’s ray cuts through Gamera like a hot knife through butter, drawing massive amounts of blood. But once again, as in the previous movie, there is a large amount of time between Gamera’s initial and final appearances. But again, the void is filled with some decent human drama. 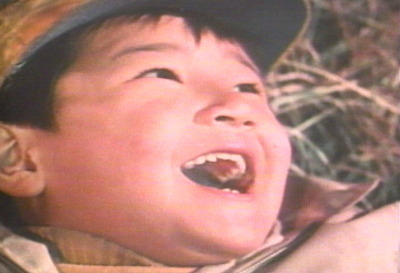 The main characters are enjoyable, and the young boy isn’t nearly as annoying as the first young actor in the series. The farmers menacing the road workers to get as much possible money for their land as they can, led by the village elder, is a good, and at times funny storyline. Once again, the military involvement in the movie played an important part, even though the plan failed, and was laughable at best. The idea of spinning Gyaos on a giant turntable to make him dizzy while luring him with fake human blood is odd, but fun to watch as well. The military and science logic would go somewhat downhill from this movie forward, but that’s another story. Gamera’s final encounter with Gyaos was another hit, with both monsters pretty evenly matched. Only through Gamera’s inventiveness was he able to stop Gyaos from beam-spamming him to death; with a rock to the mouth, of all things. Posted on September 2, 2011 0 By Jon D. B.	Daiei Movie Reviews! Posted in Daiei Movie Reviews!, Kaiju Movie Reviews!